LA JOLLA. If you were a celebrity, would you hire a vegan chef to prepare all of your meals? If you are nodding your head in agreement, it’s time to learn about Bee Green, a company that prepares and delivers organic, plant-based meals to your front door. This blog post chronicles my experience on the 3-day meal plan. How Does the 3-Day Meal Plan Work? Bee Green delivered the food to my doorstep in a reusable cooler bag with ice. Unzipping the cooler bag was like opening a birthday present. I couldn’t wait to see what surprises were inside! I assembled everything on my counter: 6 drinks, 3 entrees, 3 salads, and 3 small snacks/desserts. Bee Green also sent a helpful email with instructions and suggestions on how to maximize my meal experience. My favorite suggestion? Bee Green recommends eating your biggest meal between 10am – 2pm because that’s when your body burns the most calories. Who knew?! This meal plan is designed for maximum convenience. All of the drinks, salads, and entrees are easily portable. Also, the entrees are all housed in microwave friendly containers. 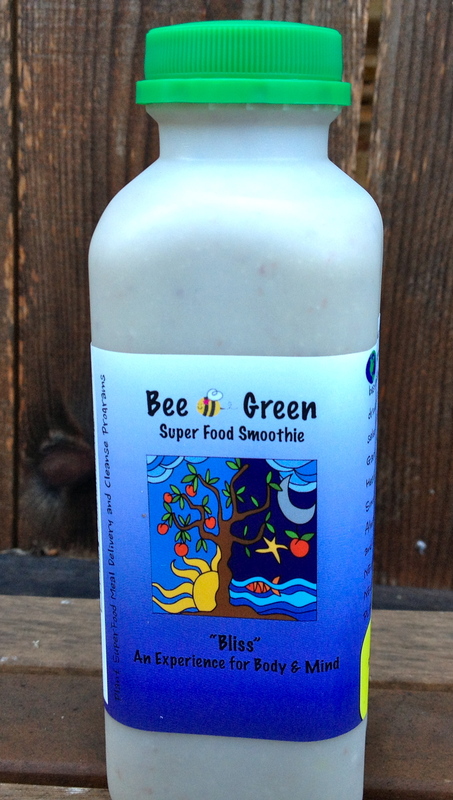 I started my first day with the Bee Green Super Food Bliss Smoothie. This was a mild tasting creamy drink made from avocado, almond, coconut, and banana. It filled me up and gave me energy for a morning work out. 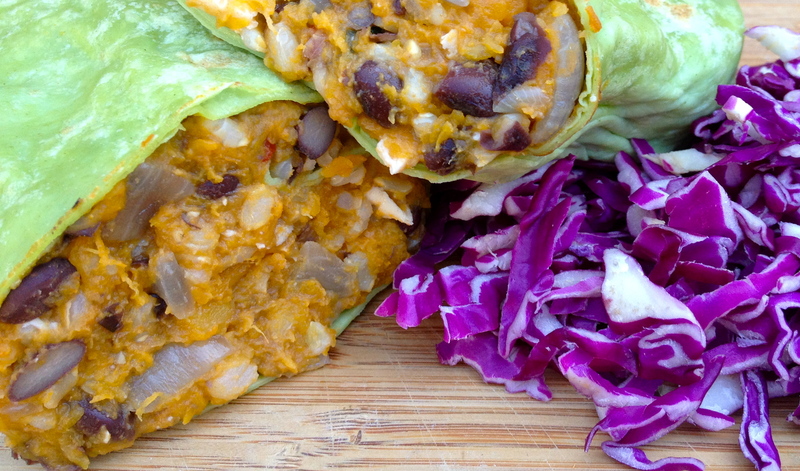 Soon after my run, I began obsessing about the Butternut Squash Rito. I love (and I assure you that “love” is not too strong of a word) butternut squash. Unsurprisingly, I could not resist this burrito. I put it in my toaster oven and tried to wait patiently as the intoxicating aroma filled my kitchen. The burrito tasted as good as it smelled. Warm vegan cheese clung to brown rice and black beans, and the roasted butternut squash melted in my mouth. And all of this rolled up in a delicious spinach tortilla! I applaud Bee Green for “making over” the traditional burrito – heavy with meat and dairy – into a healthy and energizing entree! 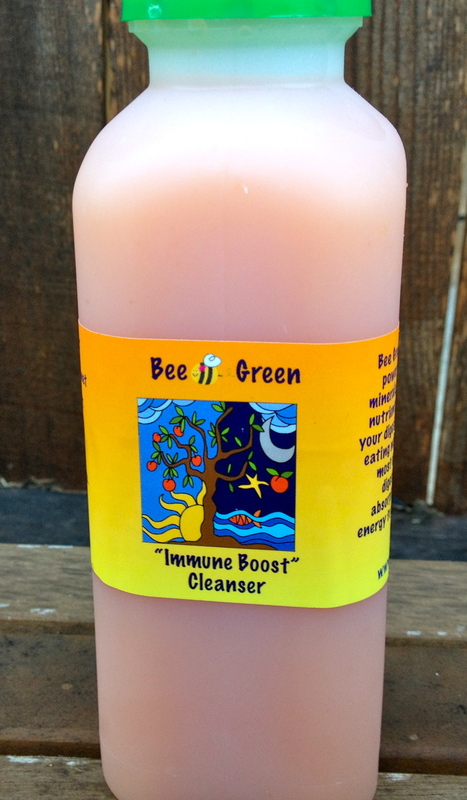 Later in the afternoon, I drank my Immune Boost Cleanser made from grapefruit, garlic, lemon, acidophilis, Udo’s oil, and cayenne. I was not familiar with acidophilis or Udo’s oil, so investigation ensued . . . The drink tasted like spicy grapefruit juice with a small aftertaste of garlic. I really liked it. The spice complimented the citrus, and the drink kept my hunger at bay for a surprisingly long time. I finished off my first day with the Mediterranean Salad made from baby kale, chickpeas, zucchini, cucumber, red bell pepper, red onion, chia seeds, and dill/mint/lemon dressing. 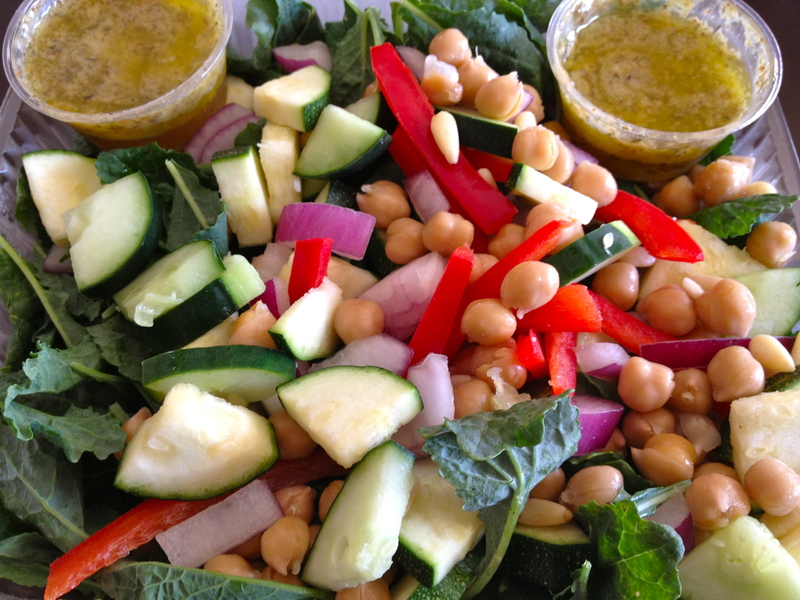 The crunchy veggies in this salad contrasted nicely with the soft chickpeas. My favorite part was the zingy, minty dressing. It was a delicious entrée salad. 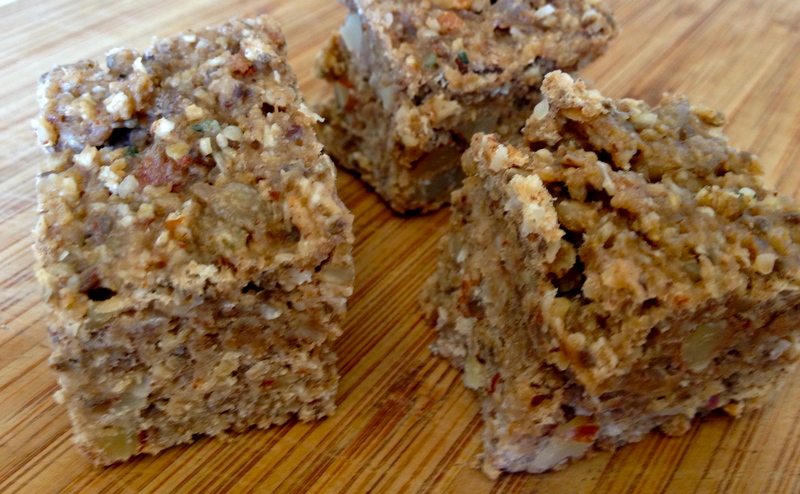 I had been eying the snack/dessert box – the Banana Bread Bar – since unpacking my bag that morning. It looked like my favorite kind of food – one that feels like an indulgence but that is actually good for you! A quick glance at the ingredients was reassuring: oats, whole flour, banana, almonds, pecans, hemp, flax, chia seeds, and coconut oil. As a helpful bonus, Bee Green had cut the banana bread into three pieces – one piece for each day. 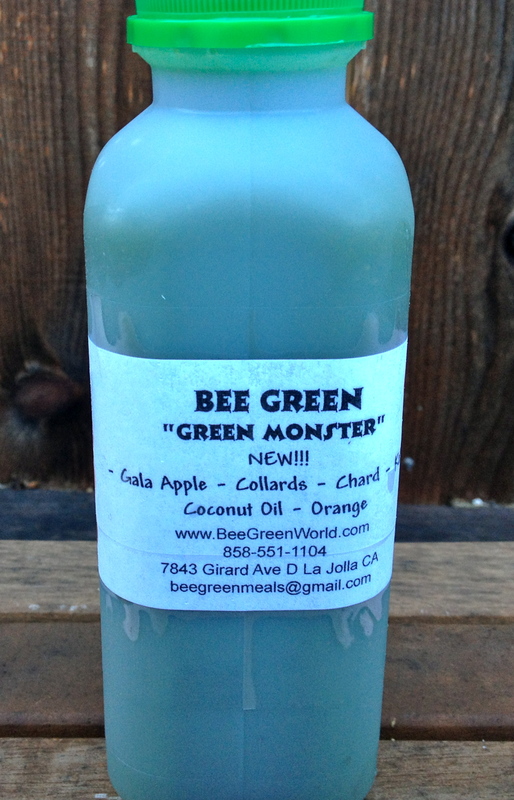 I started off Day 2 with one of Bee Green’s new drinks, the Green Monster. 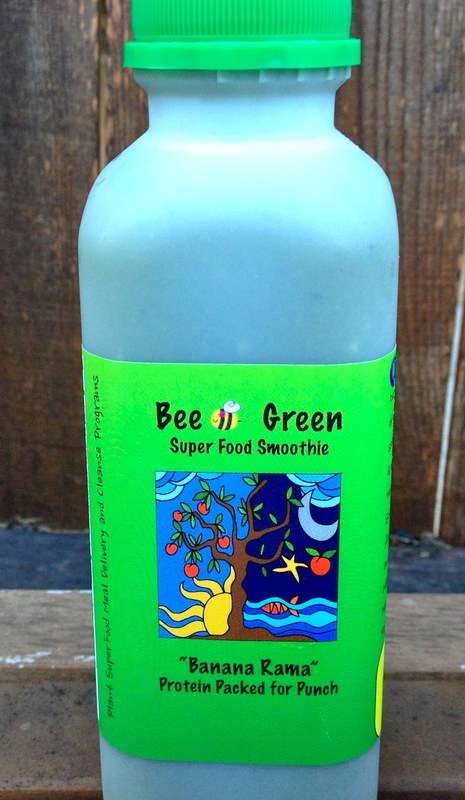 Made from gala apple, collards, chard, kale, coconut oil, and orange, it is sweet and easy to drink. Luckily, its dark green color serves as proof of the dense nutrients inside. And it paired well with my second piece of the Banana Bread bar – I couldn’t wait! 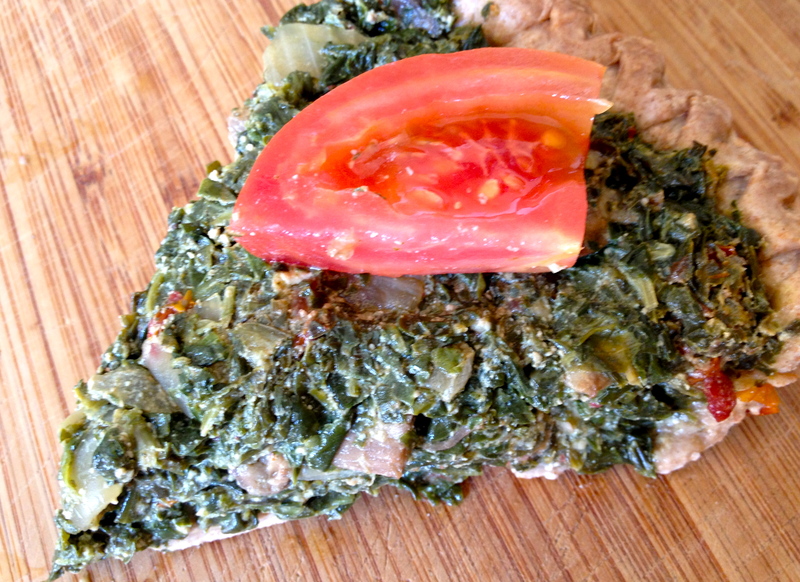 That afternoon, I was ready to try the Spinach Pie, which consists of spinach, onions, sundried tomatoes, garlic, basil, chives, and tofu in a spelt crust. The spices and the sundried tomatoes ensure that there is plenty of flavor in this pie. And the flaky vegan crust is both ingenuous and delicious. My mid-day snack was the Super Food Bliss smoothie. It was just as good as I remembered from the day before! Next up was the Green Tahini Salad. 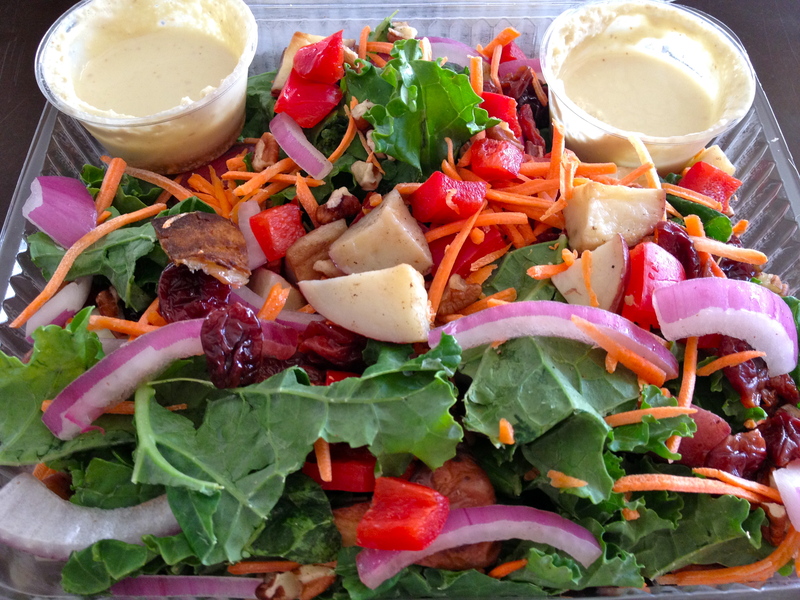 Here, we have kale, red onion, red potato, red pepper, carrots, pecans, and cranberries with a tahini dressing. In case you just skimmed the ingredient list, I will emphasize that, yes, this salad has red potatoes! They add gravitas to the salad, filling the belly. I also enjoyed the strong taste of the tahini dressing. One of the most unique and tasty salads I have had. Ever. I began day 3 with the Banana Rama smoothie, a mix of banana, spinach, almonds, coconut, and raw protein. This smoothie was thick, like a milkshake, and had a light taste of banana with a hint of coconut. And of course, while drinking this smoothie, my last piece of Banana Bread Bar disappeared. Lunch time came, and I was excited for my final entrée, the Fideua Spanish Pasta. 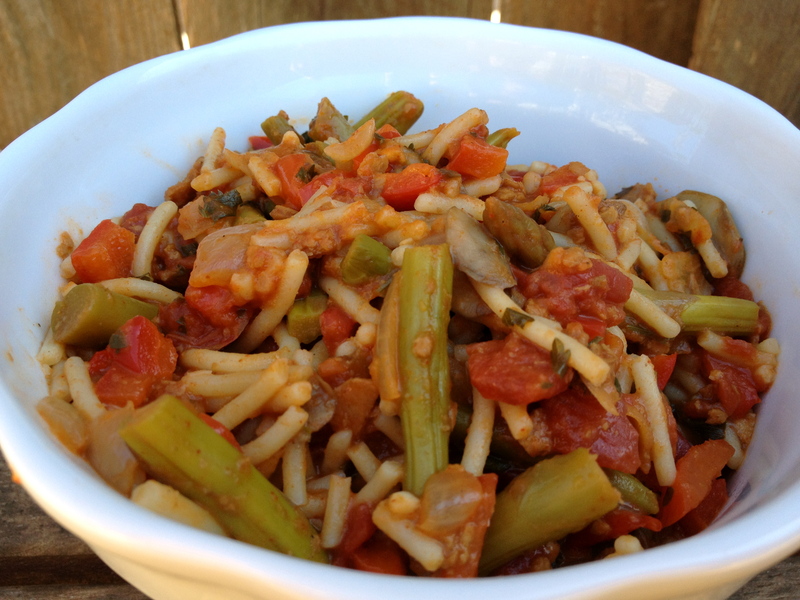 This dish is made from quinoa pasta, mushrooms, onion, red bell pepper, parsley, tomato, asparagus, soyrizo, and garlic. (People are making pasta from quinoa! How did I miss this?) Before Bee Green came into my life, I usually put pasta and red sauce in the “boring” category. But the Fideua has rebooted my whole outlook on pasta. I loved the abundance of veggies in the dish – every bite contained crunchy asparagus and delectable mushrooms. I also appreciated that the dish wasn’t smothered in tomato sauce. Rather, everything was in perfect balance, filling, but not heavy. 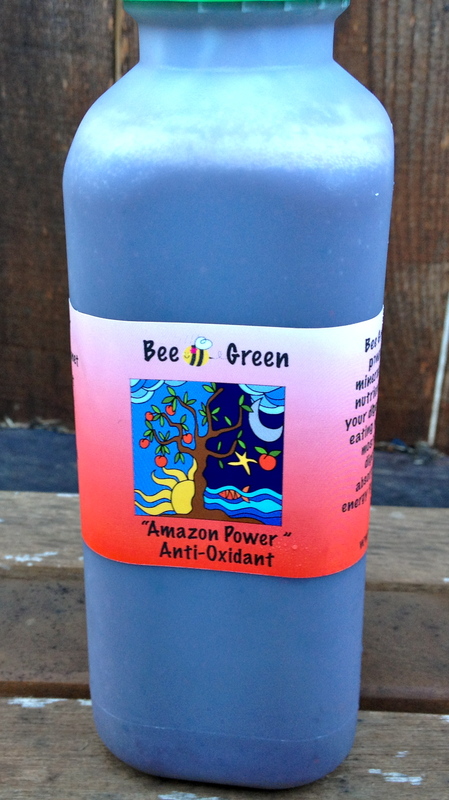 My final drink was the Amazon Power Antioxidant drink, blended from acai, red chard, red cherries, banana, and coconut water. Perhaps it was fitting that my final drink was also my favorite drink. This drink confused my taste buds in a good way – it started off sweet, but evolved into tiers of tartness. It is wonderfully unique. 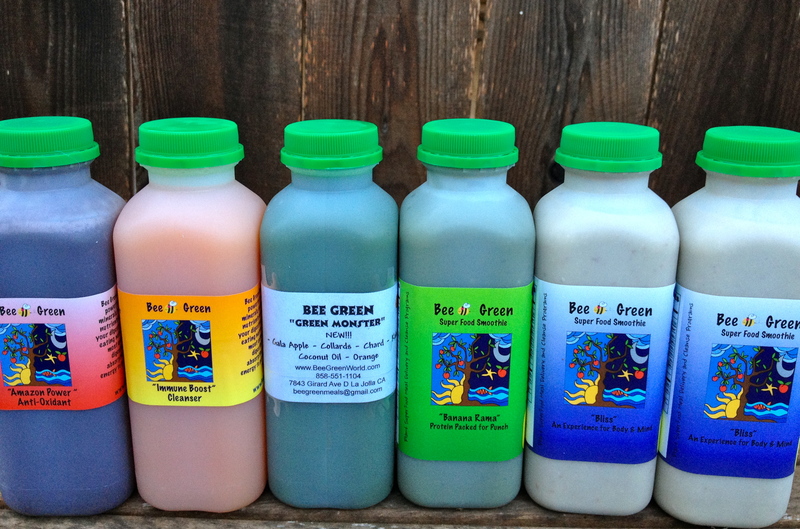 I looked forward to each portion of my Bee Green 3-day meal plan. The drinks were excellent. I liked the variety of ingredients and the resulting energy boost. The entrees were also special. They demonstrate how fresh, whole foods are powerful, filling, and satisfying. 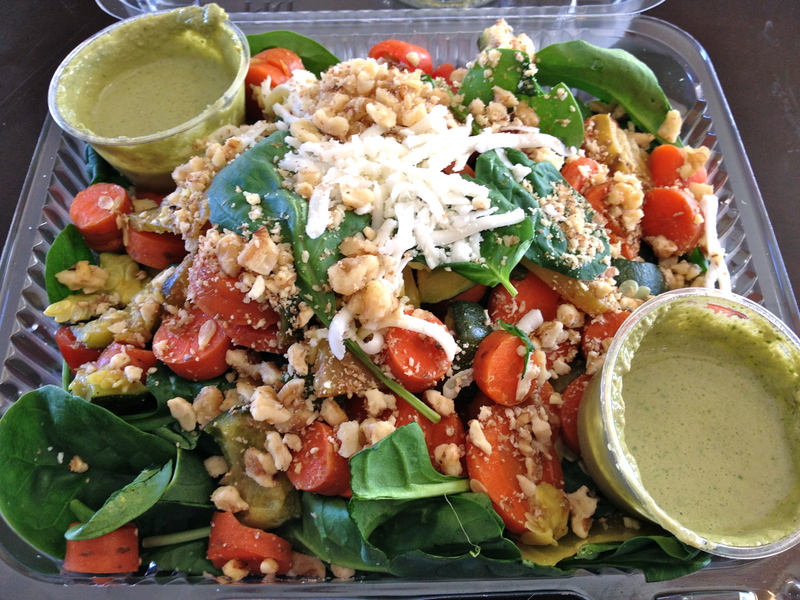 And Bee Green has renewed my interest in salads, especially those born of diverse ingredients and creative combinations. Most importantly, this meal program unlocked valuable hours in my day and eviscerated the stress of seeking meals on a busy schedule. My only task was to enjoy the food. Mission accomplished.